The X-Team is five professional athletes: the Egan brothers, John and Dan, the DesLauriers brothers, Eric and Rob, and the Greek, Dean Decas. Label it what you may: extreme-skiing, freeskiing, big mountain skiing – in this elite professional industry there exists a most tightly knit community where the five members of the X-Team have and always will be recognized as pioneers of the sport. “Skiing sparked my soul and changed my life,” reveals Dan Egan in Warren Miller’s Double Exposure, a notion emulated by most everyone in the business, holding especially true with the other members of the X-Team family. While few have chosen skiing as a career, the sensational elements of the sport are found to be a universal constant among any and all ski enthusiasts. 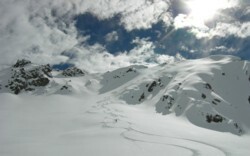 Big mountain skiing is an unrivaled form of life experience. The enormity and ferocity of the world’s mountains have the ability to humble all skiers and men, even the great. This form of skiing is characterized by the ever presence of a surging level of adrenalin where continual challenges relentlessly test one’s abilities. Often one mistake can be fatal; severely steep pitches, exposed faces and the abundance of hazards define the extremes. But once experienced, you’re changed forever; the thrill of it all becomes addicting, with every step, with every test passed, confidence increases and you crave it more and more. In this understanding, the X-Team has proven yet again to be pioneers in the field. They have pooled together their abilities and know-how, providing a means by which any skier of any ability can readily taste for themselves what it’s like to live and ski in this manner. Recently rated among the best in the world, the X-Team Advanced Ski Clinics are now in their 17th season of operation. On location in some of the globe’s most renowned ski resorts, each year the X-Team offers a variety of clinics ranging from three to eight days. Forget what it was like to receive ski instruction in the past. Beyond just the outrageous terrain, what makes these clinics so unique and worthwhile is how each and every participant will undoubtedly accomplish things they never dreamed possible, thanks to the help of the X-Team coaches. Running down the line, their credentials are simply outstanding: Dean Decas and Eric DesLauriers were named as two of the top 100 ski instructors by Skiing Magazine. John Egan and Rob DesLauriers were rated two of the top 50 skiers on the continent by Powder Magazine. Dan Egan has starred in 12 Warrren Miller films, and collectively the team appears in close to 100 others. From these five guys, skiers will gain incalculable experience, dismantling and destroying self-imposed limits while acquiring skills and memories to last a lifetime. This past ski season in the US and in Europe winter camps successfully ran at Sugarbush, Vermont, Grand Targhee, Wyoming and Chamonix, France, to name a few. The final clinic offering for the season is particularly special though, since let’s be honest: are any of us truly ready to call it quits for the season? Do you really want to pack it in for the spring and summer and hit the beach? Sure, a few days of splashing around in the ocean is all well and good, but for those of us who prefer snow over sand, there’s hope, as the answer is blowin’ in the wind – actually more like a massive gust sweeping in over the 22,615 foot peak of Chile’s Ojos del Salado, the largest active volcano in the world and the second highest mountain in the Western Hemisphere, responsible for bringing the latest bout of snow to the lower Andes. For the truly fortunate, the ski season is not restricted to those glorious months between Thanksgiving and that time in early spring when the snow begins to disappear. “Ski fever” is not simply a seasonal ailment. Utter dependence on steeps, trees, open bowls, bumps, airs and face shots are the symptoms of this rather serious condition. The craving pervades every inch of your system and will not relinquish bodily dominance simply because North America’s ski areas are absent of snow. You see, when the temperatures climb into the triple digits back East in Vermont or when it’s been weeks since the last rainfall out West in sun soaked Colorado, the snow is piling up in the Andes, this year at a historic rate, and the epic skiing is up for grabs. Chile’s Valle Nevado is one of the world’s youngest ski resorts and site of the X-Team’s final clinic of the season. Now in its 18th year of operation, the resort boasts over 20,000 acres of skiable terrain including on and off-piste runs as well as a massive availability of backcountry terrain accessible both by hiking and helicopter. To put the scale of this place into perspective consider this: Vail, with it’s many faces and bowls, tops out in the 5,000 acre range; Whistler-Blackcomb, the continent’s largest resort, is right about 7,000 acres. Aside from the sheer acreage of the region, what is so stunning about these mountains is the potential to accumulate alarming rates of vertical feet in a very short period of time. Here in Valle Nevado’s backcountry, you can knock down close to 8,000 vertical feet in a single run. Aside from areas of the French Alps and the Himalayas, runs like this are not found anywhere else on the planet. 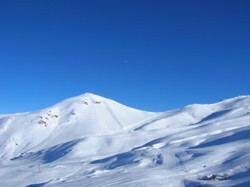 Valle Nevado’s base rests at just over 10,000 feet, so all the skiing is well above tree line. There are plenty of rocks and cornices, but for the most part the mountain is wide open. Of the eleven lifts at the resort, the Tres Puntas Poma gets you up the highest, dropping you off at right about 13,000 feet. From there the monstrous El Plomo towers above you at 18,000 feet. The scope of the Andes is just so impressive. In every direction the views are absolutely spectacular; jagged peaks line colossal canyons that seem to twist and bend out of far out of sight. The Andean backcountry provides a playground of the greatest variety; it’s steep and exposed or open and rolling, the choice is yours. When combined with the intermediate terrain serviced by the lifts, Valle Nevado’s collective offerings makes for a perfect location for an X-Team clinic as well as a mid-summer vacation for all those longing for an alpine adventure in the snow. Here, there’s something for everyone; families, couples and even the lonesome traveler will find Valle Nevado challenging, striking and inspiring. In the Andes, skiers of all levels can reach that essential point where abilities are tested and limits pushed. But as with so many things in life, achieving desired results is entirely dependent on what one puts in and nowhere is this truer than with an X-Team Advanced Ski Clinic. This year’s Valle Nevado eight-day clinic has John Egan, Dean Decas and Eric DesLauriers guiding and coaching a group of nearly 20. For the past decade John, Dean and Eric have been coming to Chile for brief stays as well as extended residencies, both on their own and with groups. What’s so extraordinary about these clinics is the expertise the X-Team athletes possess. When skiing with these guys it is really very irrelevant which mountain you’re on because it’s a guarantee that you’ll be with the most experienced and knowledgeable guides to have ever tracked up the place. Their years of experience mean you’ll be working the mountain all over like a seasoned pro, hitting all those amazing secret stashes usually only known to locals and guides. You’ll receive personal attention and coaching instruction from the some of the best skiers in the world. After listening to their thorough dissection of both their technique and your own, watch them carve immaculate turns right in front of you, moments before you ski the same run. The nature and effectiveness of the system is just incredible, flawless really. Coupled with the immense pleasures of skiing, some concentrated and focuses efforts each day will yield amazing results for each client. For a skier in this climate, it really isn’t difficult to accomplish great things, but be prepared to work for it. The stage is set, the pieces are in place; all that is required is total commitment to the program. In this regard, the X-Team coaches look to equip clients with the knowledge and experience to be able to “ski the whole mountain” under each and every condition. Indeed, the eight days spent at Valle Nevado provided such a spectrum where each coach’s lessons were dependent on the variable conditions of the terrain. Whether it’s soft spring snow or light-fresh powder coating the slopes, Valle Nevado is the perfect location for all skiers to generate or improve a wide range of skills. Each day a new adventure awaits and there are endless options: First, take a few days to familiarize yourself with the lift-serviceable terrain. Don’t be afraid of the Poma’s because as with some North American ski resorts like Crested Butte in Colorado, these tows get you to some of the best inbounds runs the mountain has to offer. From the top of the Tres Puntas tow there are some hiking opportunities. These hikes range from 10 minutes to well over an hour. One of the greatest day’s of the clinic began when we purchased joint passes to La Parva and then took the whole morning to hike up the spine of La Parva Peak. 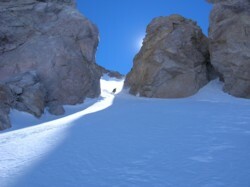 Perfect open faces funnel down into beautiful couloirs and then out to a wide open run off. Skiers are then deposited at the base of one of La Parva’s tow ropes, the border of where Valle Nevado and La Parva meet. Nearly 100 skiers had gathered at the top of the El Paso lift to watch our group ascend the ridge and then drop in and shoot the couloirs, proving that anyone can become an inspiring spectacle on the mountain as long as they’re willing to work for it. 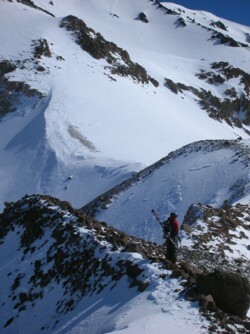 Beyond Valle Nevado, the exploration of La Parva and El Colorado are adventures in and of themselves. Accessing both of these areas requires the purchase of a separate lift ticket. El Colorado has a massive wall that faces the Valle Nevado basin. The many shoots and faces of this area also extend even farther west, running out into the road leading up the resort. On one day of the clinic, the group arranged for a truck to shuttle them up the road after each run, yet another way to have a fairly exclusive and unique adventure away from the lifts. Then there’s the heli-skiing. While this option is far and away the most adventurous and extraordinary of them all, be prepared to pay significant fees for such outstanding vertical glory. The heli-skiing operation at Valle Nevado is extremely professional. American guides run the show and experienced Chilean pilots do the flying in brand new Eurocopters – Helibras AS350 B3. 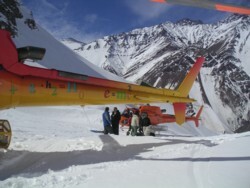 For these awesome excursions, avalanche beacons and equipment are supplied to each group flying. There are briefings for these outings where equipment tutorials and general discussion are well structured, thorough and of the utmost seriousness. The guides are always the first to test and ski the slopes. If the snow breaks and they’re caught in a slide, they want to be sure that the rest of the team is equipped with the skills and gear to perform a rescue. The guides here are some of the most experienced and trusted in the industry and clients should be assured that in the case of an avalanche they are in the best of hands. However, these briefings aren’t intended just to insure the safety of the clients but also to assure the well being of the guides; there are no exceptions to these rules: to fly you must be present for one of these meetings. Landing zones are scattered near and far through three huge canyons and the terrain is simply astounding. Again, be warned: the price to heli-ski is steep enough to dissipate one’s budget in a single day. Though if you’ve never been, you really must go at least once. When you’re out there accruing over 6,000 vertical feet per run on the most outrageous faces, charging through what can only be described as “ego-snow” of the most supple variety, the fee for this utter triumph quickly becomes a non-issue. Unfortunately, under new management this year, such a dynamic relationship between finances and thrills seems to be an overarching theme here at Valle Nevado. Prices have drastically increased and the economical impact of these sudden changes has been sorely felt among the returning veterans. Try as they might however, this shift in management cannot spoil the lore of ski culture down here south of the equator. The thrills are most definitely worthwhile, and though some things are outrageously overpriced, like with any vacation experience, there are certainly ways to skirt around some of these newly founded tourist traps. When staying at one of the resort’s three hotels, breakfast is fair game at any of the restaurants and dinner, excluding the cost of beverages, is included at three of the four. In the Tres Puntas hotel there is the Chilean buffet. The Puerta Del Sol hotel houses the remainder: the Italian option, the Swiss fondue option and then the French restaurant, the one that is not included as part of your stay. Accommodating a wide range of tastes, each dining option is solid, making available plenty of delicious and vital ski fuel. 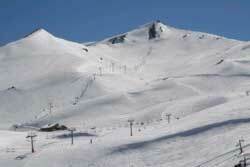 Your typical practices to insure cost effective skiing are readily applicable here in Chile. The on-mountain dining options are weak and overpriced so at breakfast – take advantage of the cheese and meat offerings and prepare sandwiches for the day ahead. This is an especially pertinent practice if you’ll be going heli-skiing as no food is provided for those who fly. Even before the cost spike at Valle Nevado, it was standard practice to stock up at one of the super-mercados down in Santiago, and this advice is still relevant. Go for essentials: 5-liter jugs of water, cases of beer and well priced Chilean wine. Though one of the most ludicrous new policies at Valle Nevado is the corkage fee at the restaurants; it costs 9,000 pesos (or 18 dollars) to bring your own bottle, even if the bottle is already opened and partially consumed. Pisco, Chile’s own nationally produced alcohol, used to make delicious Pisco-sours, once was priced at five dollars a bottle. Having increased twenty fold, you can now expect to pay close to $100 up at the resort. While the dollar goes pretty far in Santiago and throughout other areas of Chile, at Valle Nevado things have gotten a bit out of control. To do it right, it’s ok to spend money on vacation, but nobody wants to be ripped off. Rumors were circulating that the new owners may already be looking to sell the resort, perhaps trying to show some nice short term profit figures for a padded sale. Or maybe it has to do with the Brazilians, the resort’s top clientele who comprise nearly 80% of Valle Nevado’s annual guests. For the South American masses, skiing is a fairly new recreational outlet. For the past decade the Brazilian upper/middle has been ski crazy and this particular demographic seems to be willing and able to pay any price to participate in the sport. So Americans are not a target here, merely an economic happenstance paying the price for Valle Nevado’s unfortunate state of managerial affairs. But thankfully, while recently many surface level changes have been implemented, the core of Valle Nevado and the spirit of the Andes remain untouched. Navigating each of the sixty-eight harrowing, nauseating switchbacks laid into the steep mountainside is like ascending a giant staircase one step at a time. This impossibly narrow road marks the path up to Valle Nevado’s beautiful open slopes and for the life of me I cannot understand how Eric DesLauriers is able to cat-nap it through the first forty of these turns. When his eyes open, the sight of falling snow instantly revitalizes him. It’s coming down in heavy grains, pumping up the already monstrous snow banks like over inflated inner tubes. Outfitted for the cold in green one piece suits, fur hats and goggles, Chilean military officials regulate the flow of traffic up and down the last snow covered section of road. My van is filled with skiers returning to Valle Nevado for the second, third and even fifth time. Squirming with excitement, looking around in all directions, they say it’s been years since they’ve seen snow like this here, accumulating in such large quantities at elevations so low. I’ve been looking forward to this first half-day of skiing for over a month now and the news of the impending conditions doesn’t make the forty-five minute delay any easier to withstand. Finally the last car in the descending caravan goes by. Chains are mandatory at this point and as we begin chewing up the road for the final stretch before the resort, the reverberations shake my brain and I feel so alive. The van reaches the 10,000-foot plateau for skier parking and hotel drop off and it’s like being trapped in a ping-pong ball; even at the base it’s a total white-out. When in shorts and sneakers I step out into the fresh snow and breath in that cold wet air, I’m instantly taken back to wintertime in Colorado. I knew it would be winter in Chile, but for the first time I become aware that I’ve been reunited with this, my favorite of all seasons. 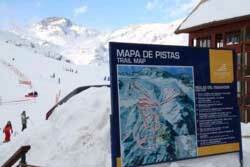 Under the circumstances, it is almost a right of passage to ascend this path up to Valle Nevado. The mountain road was a trial at the time, but when the moment arrives and the lift comes barreling in and you’re scooped up, skis dangling freely in the air, you know you’ve made it; it’s all so bliss. The soul of skiing is most definitely intact in Chile and for the X-Team and all their faithful devotees, that’s really all that matters. Absolutely nothing can take away from the excitement of heading off for a South American ski adventure during the heart of the summer. The aura of these clinics and the people who are part of them are just too powerful and impressive to allow for such inconsequential people and policies to affect the larger goals and ambitions of the group. Ski dreams are out there and the X-Team knows as well as anyone how to attain them. Irregardless of who you are or where you come from, in the Andes, the opportunity to achieve incredible things is right at your fingertips. Whether you’re hiking to reach “the goods”, heli-skiing to accumulate that endless vertical, or just lapping the lifts all day long – with the willingness to step outside of your comfort zone, in Chile, ski dreams come true.